Review by AllTheBestFights.com: 2015-09-05, pretty good finish between Anthony Johnson and Jimi Manuwa but it is not enough to get three stars: it gets two (UFC Performance of the Night). Anthony Johnson entered this fight with a mma record of 19-5-0 (68% ko/tko victory rate – he has never won via submission) and he is ranked as the No.3 light heavyweight in the world (currently the #1 in this division is Jon Jones). He has already fought twice in 2015 beating Alexander Gustafsson (=Gustafsson vs Johnson) but then he lost to Daniel Cormier (bout valid for the vacant Ufc light-Hw title, Johnson vs Cormier). His opponent, Jimi Manuwa, has an official record of 15-1-0 (93% finishing rate) and he entered as the No.13 light heavyweight. He suffered his first professional loss in 2014, against Gustafsson (=Gustafsson vs Manuwa), but he came back to win in 2015 defeating Jan Blachowicz (=Blachowicz vs Manuwa). 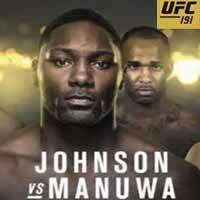 ‘Rumble’ Johnson vs Manuwa is on the undercard of Demetrious Johnson vs John Dodson 2 – UFC 191. Watch the video and rate this fight!